Plenty of small homes and small interior spaces take their cues from boat and airplane interiors, however this is the first I’d heard about where the inspiration for the design came from a prison cell, and expertise from the prisoners. 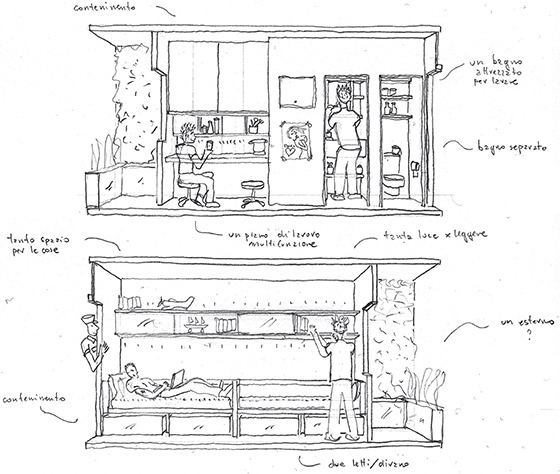 The perhaps somewhat ironically named Freedom Room project is a 4 × 2.7 m living space. At just 116 square feet this is much smaller than most of the other “small space” builds I’ve seen, it really is the size of a prison cell. The projet is the brain child of three Italian designers; Aldo Cibic, Tommaso Corà, and Marco Tortoioli Ricci, from the Cibic Workshop along with the design collaborative Comodo. Inmates from Italy’s high-security prison in Spoleto served as consultants on the project. Everyone can be a maker. It’s unlikely that the vision will make its way into Italian prisons you can see it easily becoming a blueprint for temporary social housing, high-end youth hostels, and dorm rooms. If you’re interested in the thinking behind the project, and can read Italian, a free book talking about it has been released.